Get the best results from your HP printing system. 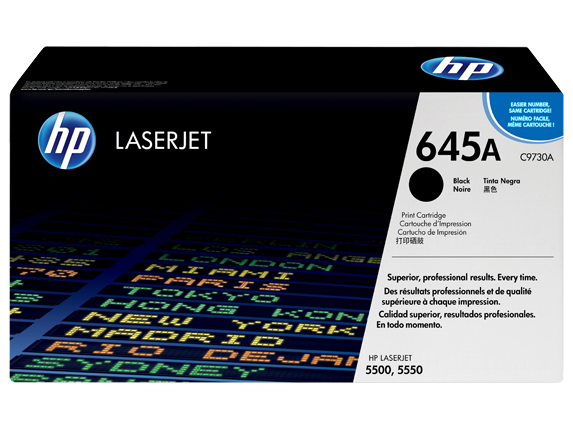 HP Smart technology and chemically-grown toner formulas in HP 645A LaserJet Toner Cartridges work with your printer to deliver accurate, consistent color and reliable, cost-effective performance. 1 Using genuine HP supplies ensures availability of all HP printing features. 2 Available with the HP Color laserJet 5550 Printer only. This feature enables users to print up to 500 pages in black after a color cartridge runs out. 3 Available with the HP Color LaserJet 5550 Printers only.